This portion of the interview pertains to Jean Scott's memories of her former neighbour, Burnaby pioneer, Tom Irvine. Recording is of an interview with Jean Scott conducted by Colin Stevens on September 19, 1978. Major themes include: Tom Irvine and Laurel Street. Jean Scott came from Scotland to Burnaby with her family in 1913 when she was five years old. The Scott family settled on Laurel Street, at the northwest end of Burnaby Lake. This portion of the interview pertains to Jean Scott's memories of Tom Irvine's house, next door to the Scott family's home on Laurel Street. This portion of the interview pertains to Jean Scott's memories of Tom Irvine as well as the layout of his house, next door to the Scott family's home on Laurel Street. This portion of the interview pertains to Jean Scott's memories of her neighbourhood. Recording is of an interview with Jean Scott conducted by Colin Stevens on September 19, 1978. Major themes include: Burnaby Lake and Laurel Street. Note in blue ink on verso of photograph reads: "Irvine House December 1974 (reprint from slide)"
Photograph the roof and chimney at Tom Irvine's house in its original location on Laurel Street in Central Burnaby. Photograph of the side yard at Tom Irvine's house in its original location on Laurel Street in Central Burnaby. Note in blue ink on verso of photograph reads: "Irvine House sideyard [sic] December 1974 (reprint from slide)"
Photograph of the front porch of Tom Irvine's house in its original location on Laurel Street in Central Burnaby. Photograph of the interior of the wood shed by Tom Irvine's house in its original location on Laurel Street in Central Burnaby. The house was constructed in 1911 and later moved to the Burnaby Village Museum in 1975. Photograph of the front door and kitchen at Tom Irvine's house in its original location on Laurel Street in Central Burnaby. Photograph of the front room and kitchen at Tom Irvine's house in its original location on Laurel Street in Central Burnaby. Photograph of bedroom at Tom Irvine's house in its original location on Laurel Street in Central Burnaby. Photograph of the bathtub and toilet in the basement of Tom Irvine's house in its original location on Laurel Street in Central Burnaby. Note in blue ink on verso of photograph reads: "Irvine House Basement December 1974 (reprint from slide)"
Photograph of the sink and the washing machine in the basement at Tom Irvine's house in its original location on Laurel Street in Central Burnaby. Photograph of the tattered curtain (over a small window) in the basement at Tom Irvine's house in its original location on Laurel Street in Central Burnaby. Photograph of the chimney bricks (with inspection stickers by Bill Ham) in the basement at Tom Irvine's house in its original location on Laurel Street in Central Burnaby. Photograph of the basement ceiling at Tom Irvine's house in its original location on Laurel Street in Central Burnaby. Photograph of a pile of coals that were stored in the basement at Tom Irvine's house in its original location on Laurel Street in Central Burnaby. 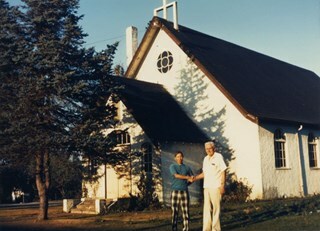 Photograph of Jack Sims and Father Chang standing in front of St. Theresa's Church, shaking hands. The church was located at the southeast corner of Canada Way and Laurel Street. Built in 1929, it was torn down in 1974, and a new church, St.Theresa's Parish, was built across the street. Photograph of Jack Sims and John Aloysius "Jack" McGeachie sitting on the front steps of St. Theresa's Church. Both men are dressed in white.The church was located at the southeast corner of Canada Way and Laurel Street. Built in 1929, it was torn down in 1974, and a new church, St.Theresa's Parish, was built across the street. 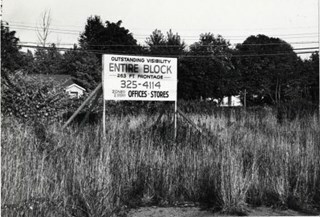 Photograph shows a sign advertising vacant lots at Canada Way and Laurel Street, zoned for stores and offices. Photograph of three unidentified men standing on Douglas Road (later renamed in part Canada Way) with Laurel Street in the background on the left and the site of Saint Theresa's Roman Catholic Church as a lot with blackened stumps. The church was located at the southeast corner of Canada Way and Laurel Street. According to an accompanying note located with the photograph, the first church building burned to the ground the night before it was to be blessed. Insurance for the church had been arranged for by Colonel Dorrell only hours before it was burned and even though signatures had not been affixed to the policy, the insurance company honoured the claim. The second building was smaller and had no basement. Father Trainer was the first priest. 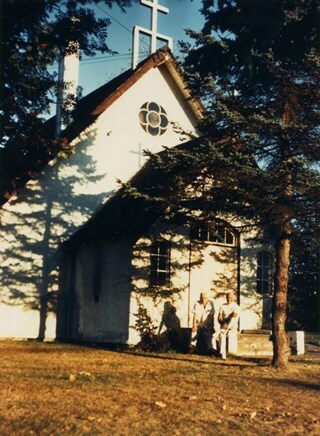 This church was torn down in 1974 and a new church building was erected across the road on Canada Way.